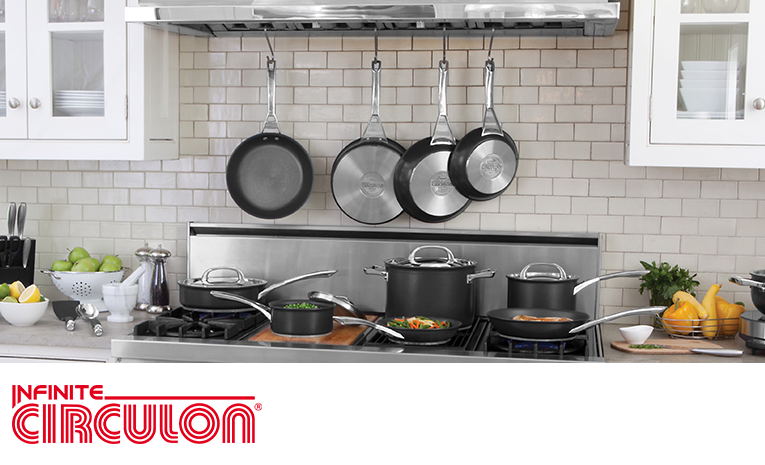 As the creators of the only gourmet cookware with unique raised circles designed to make our TOTAL® non-stick system last longer, Circulon has been a leader in offering healthy cooking solutions. With our TOTAL® non-stick system reducing the need for butter and oil from your everyday cooking, you can cook great, and feel great, every day. 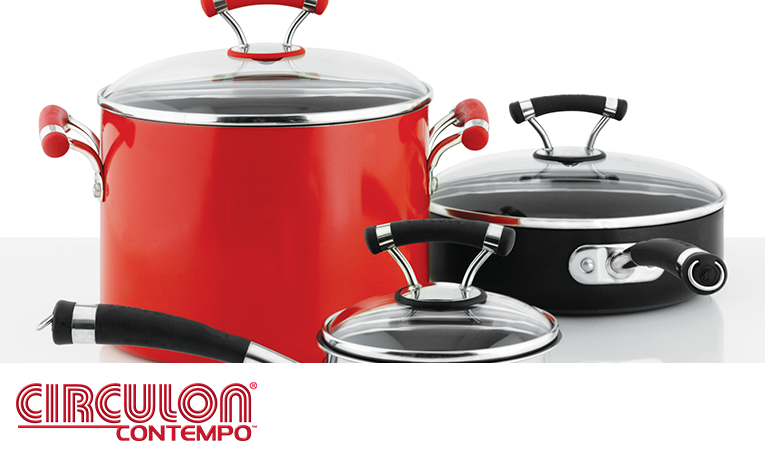 Circulon ranges many different cookware products, in a variety of materials to suit your needs in the kitchen. From hard anodised, stainless steel to the highest quality aluminium, and whether you'll use your pans for making meals for yourself, entertaining friends or cooking for your family, you'll be sure to appreciate the outstanding durability and performance of Circulon. 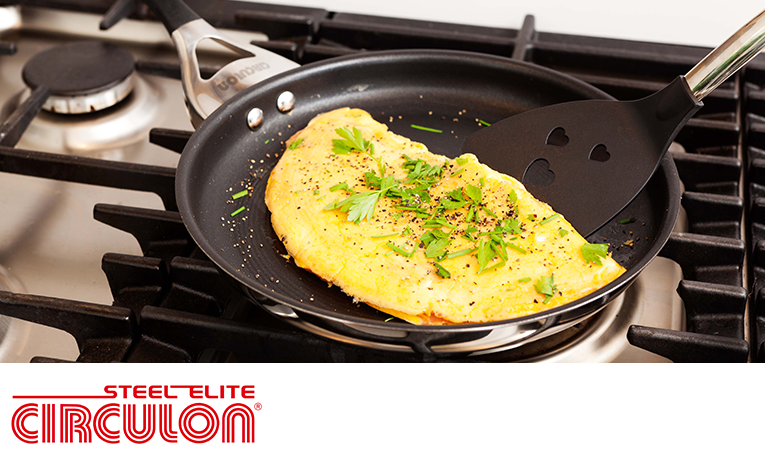 Circulon Ultimum is the latest in non-stick cookware innovation. 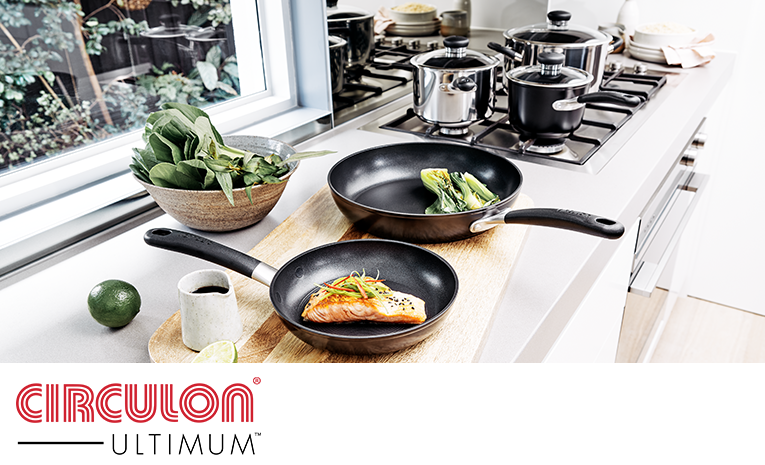 Available in high density forged aluminium or high-performance stainless steel with an edge-to-edge induction base, the Circulon Ultimum collection offers our new Ultra Total® non-stick system. With an improved profile to our unique hi-low grooves to ensure food will not stick, significantly reduce abrasion and enhance the cooking performance of Circulon Ultimum, an easy clean patented flush rivet design means no stubborn bits of food left to clean! The lids are shatter resistant with tempered glass to allow you to view your cooking, whilst helping lock in flavours and nutrients and all pieces are truly dishwasher safe with no exposed rims and high-heat resistant handles that are oven safe to 200°C. Backed by our hassle-free lifetime guarantee and our brand promise, Circulon Ultimum is uniquely designed to be the ultimate choice for your kitchen! Built for a lifetime of hassle-free cooking, Circulon Symmetry combines high-technology performance with an elegant flared shape to provide great durability, exceptional heat conduction and a beautiful design to compliment your kitchen. Suitable for all cooktops, including induction and available in hard-anodised aluminium, polished stainless steel or rich chocolate exteriors, the superior performance of our unique TOTAL®non-stick system of hi-low circular grooves and premium PFOA-free non-stick coating, ensures that you can create fresh, healthy exquisite dishes without the need for added oils or fat. Backed by our hassle-free lifetime guarantee and our brand promise, Circulon Symmetry will withstand the demands of everyday cooking and of course, Food will not stick…guaranteed! 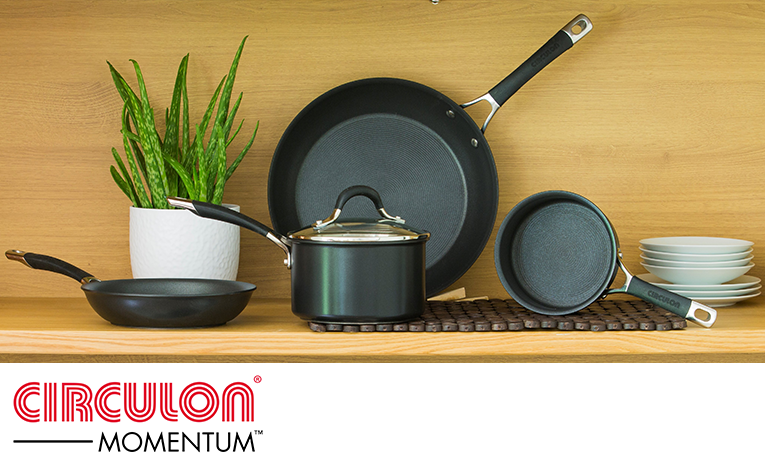 Revitalise your kitchen with a fresh solution for cooking performance with the versatile, efficient Circulon Momentum cookware range. This collection, available in hard anodized aluminium and high performance stainless steel, combines our unique circle technology and TOTAL® non-stick surface to deliver effortless food release with resistance to scratching, staining or chipping. With products with features such as straining lids and large grill plates, Circulon Momentum will not let you down for years to come. Backed by our hassle-free lifetime guarantee and our brand promise, Circulon Momentum will withstand the demands of any kitchen and of course, Food will not stick…guaranteed! Circulon Infinite not only looks fantastic, but performs at the highest level every time. This professional quality range is constructed from heavy-gauge, hard-anodised aluminium and has been treated with cutting edge, state of the art methods to ensure great non-stick performance and longevity - making Circulon Infinite cookware a distinguished choice in any home kitchen. Not only adding exceptional style, the high quality stainless steel lids and riveted handles, provide this commercial grade cookware the capacity to go in the oven to higher temperatures of 240°C. Backed by our hassle-free lifetime guarantee and our brand promise, with Circulon Infinite cookware, the possibilities are infinite! Designed for heavy duty use in a busy kitchen, Circulon Steel Elite brings together high quality polished stainless steel and Circulon's unique hi-low circular grooves and PFOA-free premium non-stick coating to make Circulon Steel Elite a breeze to cook with and so easy to clean. Featuring striking lids of stainless steel and glass, to allow you lock in nutrients and monitor food without lifting the lid, Circulon Steel Elite ticks all the boxes. Backed by our hassle-free lifetime guarantee and our brand promise, choose Circulon Steel Elite for timeless good looks and durability. Invigorate the kitchen for fresh, healthy cooking with Circulon Contempo. 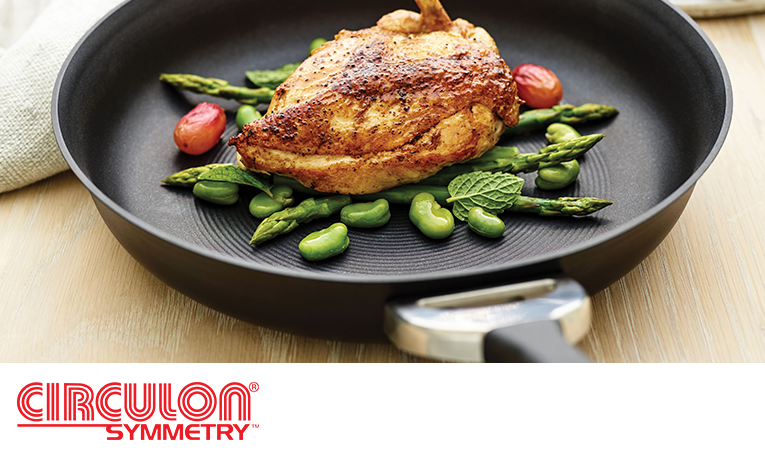 Featuring Circulon's unique circles that reduce surface abrasion, coupled with our advanced 3-layer PFOA-free non-stick technology, Circulon Contempo delivers extraordinary food release and exceptional durability while being metal utensil safe. Whether your kitchen suits a bold burst of colour, classic elegance of silver or stainless steel or sleek black hard-anodised cookware, Circulon Contempo offers fast, even heating and great cooking results on all cook tops, including induction. Comfortable silicone and stainless steel handles are double riveted for extra strength and can go in the oven to temperatures of 200°C, while the shatter-resistant tempered glass lids allow for monitoring the cooking process without losing moisture or flavour. Backed by our hassle-free lifetime guarantee and our brand promise, Circulon Contempo will add a touch of style to your kitchen! We care about healthy, non-stick cooking and believe that the decision to be healthy is one you should make for life. Our cookware comes with our Circulon hassle-free lifetime guarantee, which is designed to ensure that you can get the most out of your non-stick pan. We promise that if you are not satisfied with the performance of our non-stick system, we will replace it completely free of charge. That’s our promise to you!